Maha-Mantra Week - September 24 to October 4 ~ The Toronto Hare Krishna Temple! 50 years ago, His Divine Grace A.C. Bhaktivedanta Swami Srila Prabhupada stepped off the ship Jaladutta and arrived in Boston. He bore just one desire in his heart: to share the impeccable glories of the Hare Krishna Maha-Mantra all over the world. Today, he is celebrated in over 500 ISKCON centres for sharing the imports of the pristine Vedic knowledge! Within a span of just over a decade, he established hundreds of temples and inspired thousands. This year from Sep 24th - Oct 4th, 2015, ISKCON centres all over the world will commemorate the arrival of Srila Prabhupada to the West. Here in Toronto, we have 10 days of various activities lined up for you. Also known as the 'World Holy Name Week', the intention of this festival is to appreciate and share what Prabhupada has given us and spread the (Holy) word! We encourage you to make the most of this by participating in multitude of ways; please read on for details. Interactive sessions ranging from Srila Prabhupada's: an inspiration for all and how to improve chanting to how to lead a balanced life and significance of chanting and more. 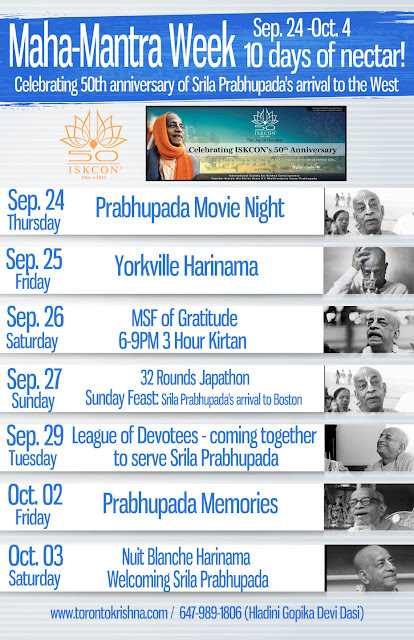 Join us for the monthly sankirtan festival, this month in honour of Srila Prabhupada's magnanimous gift. We will celebrate it as the festival of gratitude, and share kirtan, prasad and the holy name with the residents of Toronto. After the monthly sakirtan festival, come join us for a 3 hour kirtan in the evening. Immerse yourself into the sublime depths of the Hare Krishna Maha-mantra in the association of others! A chance to connect deeper with the holy name by chanting 32+ rounds in association of other devotees! An intimate evening of association with disciples of Srila Prabhupada and an opportunity to hear about their experiences. Hladini Gopika Devi dasi: 647-989-1806 or email: toronto.sankirtan@gmail.com.